Randall-Reilly / Faceboook / What Can Facebook Do for Your Dealership? We recently discussed how useful Search Ads are and how they are a tremendous tool that many dealerships have failed to take advantage of (for more on that you can refer back to our article, Can Search Really Help Truck Dealerships?). In that article, I also briefly touched on some options, such as Web ID and Facebook. Using these in conjunction with Search really give you an edge over the competition. Today I’d like to dig a deeper into the many options available on social media platform of Facebook. 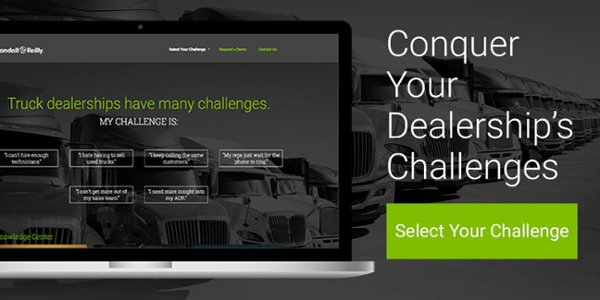 Dealerships must fight to stand out from the competition, and the best way to do that is to reach the fleets you’re after where they are – online. Where do they go when they’re online? According to our CCJ Connectivity Report (2017-2018), 53% of those surveyed are on Facebook, with almost 20% of those claiming to constantly check in on the platform. With those kind of response numbers, it’s easy to see that Facebook is a viable option for dealerships to pursue. But with so many options available it is hard to know exactly what to do or where to start. Facebook is also constantly expanding their advertising options, which is excellent from a marketing perspective, but it can also make it difficult to stay current and know the full extent of the capabilities available to you on the platform. So, let’s take a look at what Facebook has to offer and go through what it means to you and your dealership. The first step to advertising on Facebook is deciding what approach you’d like to take and how you want your messaging to look and where you want it placed on the site. The news feed is the primary way people navigate the current form of Facebook. Ads placed in the feed are designed to pique the prospect’s attention while not beating them over the head that they are being marketed to. The basic approach of placing an ad in the feed is to make it feel like part of the overall Facebook experience itself. Photo ads use a single image of your choosing and features a brief description and link. Take your ads to the next level and feature a video ad to help capture the attention of your target audience. Do you find yourself thinking a single image or video just isn’t enough? Facebook has you covered. Carousel ads allow you to feature up to 10 separate images or videos in a single ad that prospects can scroll through (each with the ability to have their own separate link). Slideshow ads are designed to help you get the “wow” factor of videos without the added cost or effort of having to actually produce a video. Select photos or videos and the slideshow add will automatically play through them to create a slideshow experience for them. Now that we’ve covered some of the most popular and effective options available to you it’s time to ask, “who are you trying to reach?” Facebook has some tricks up its sleeve for that too. Serve your ads to a custom-built audience you upload to Facebook. This can be a list you already have such as former or current customers, a list of those who have already visited your website, or a list of prospective customers you’d like to target acquired via a third-party database or platform such as RigDig Business Intelligence. Where is your business coming from? Do they have something in common? Lookalike audiences consist of other people or companies on Facebook that match aspects of your current customers’ information. Demographics – Target based on age, gender, education level, employment, or even relationship status. Location – Target and serve your ad to those in a certain geographical area. Interests – Target based on users interests, hobbies, and entertainment tastes. Behaviors – Target based on behavior traits like purchase history or activity and device usage. As you can see, there are many ways to reach a specific target audience online through Facebook. Today we’ve covered a handful of the ways, but we’ve only begun to scratch the surface. Don’t get left behind. Get the most out of Facebook and gain an edge over your competitors. Not sure where to start with Facebook? Let us know! Randall-Reilly can help you reach your goals and find the customers you want most with campaigns designed around you and your unique requirements. Whether it’s helping you navigate the ins and outs of the options available through Facebook itself, or helping you create a custom audience based on data through RigDig, we can help.